On a sunny spring afternoon in late May, the lower school’s outdoor field was magically transformed into “middle earth,” complete with interactive goblin slayings and wizard encounters. The annual grade 5 Hobbit Battle, in which students played both imaginatively and collaboratively, was the culmination of an exploration of medieval literature. “It made the literature we had earlier read in language arts come to life out on our field. 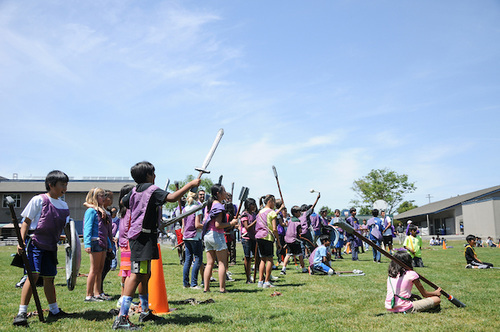 We invited a renowned LARP (medieval sword) master to lead the games with the students, and many teachers played along as well,” recalled Annamaria Smitherman, grade 5 language arts teacher.